Our staff at Transfer Me to DVD has been in the transferring business for over 30 years so you can feel confident that the priceless heirlooms you send us are being handled by our highly skilled team of experts carefully and with respect. We take all forms of media like film 8mm/16mm (silent/sound), video tapes, slides/photos, audio reel to reel, cassettes, records, 8 track tapes, camera hard drives/memory cards and with our cutting edge technology and state of the art equipment, digitally transfer it to DVD, CD, Flash Drive or Hard Drive with the best possible quality ensuring your memories will last forever. Digital copies made of your video tapes, movie film (8mm/16mm), photos, slides or audio material can be stored on Flash Drives, DVD, Blu-ray Disc, CD or external Hard Drives. Bring your original materials to our shop at 5318 Heatherdowns Blvd, Toledo OH, six days a week. Transfer Me To DVD is Toledo's Best at Preserving Memories. The most important part of our business is protecting your family heirlooms and earning your trust. We're listed with the Toledo BBB and you can check our accreditation here- Transfer Me To DVD. All work is performed by us- nothing is sent out. If you live outside the area, for orders over $120 we'll ship your completed order to you FREE shipping, via Priority Insured Mail. Once your family history is digitized it's easily duplicated so all your family members can share copies for generations. Burn DVDs of your old movies, pictures or film so they're never lost. 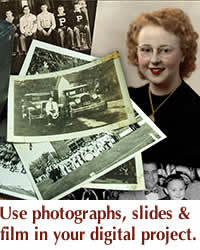 Let us help preserve your family history- stop in to see us, before those memories fade.